ConceptDraw DIAGRAM Wireless Network solution is a bundle of the vector stencils, examples, and templates for drawing different types of wireless network diagrams. Wireless Network solution includes 81 of professional-looking stencils and several samples that you can modify and make your own diagram. Sample 1. 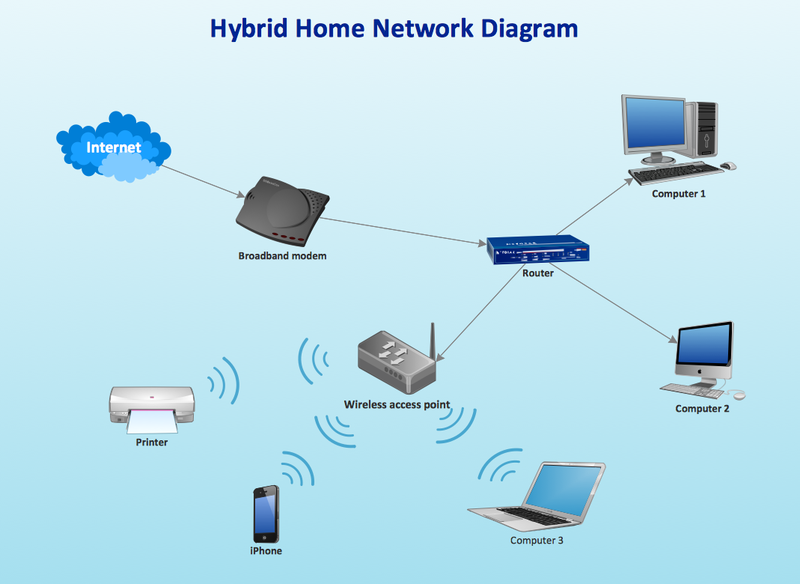 Hybrid Home Network Diagram. ﻿WLAN diagrams allows to clearly represent and communicate wireless network architecture, topology, and design to engineers, stakeholders and end-users. Wireless network mode engineers can schematically diagram with help of the ConceptDraw DIAGRAM v12 best Network Diagramming software.